HEART UK’s FH (familial hypercholesterolaemia) Day of Action was orchestrated in order to apply pressure on the Government, NHS and the National Screening Committee (NSC) to implement a screening programme and improve services for FH patients. The condition effects approximately 1 in 250 in the UK, with an estimated 80-90% undiagnosed. If left untreated the condition can be fatal. HEART UK’s Ambassador Network was mobilised to support the Day of Action and drive political pressure to improve FH services. The Day of Action consisted of a workshop which upskilled 21 Ambassadors on how to effectively campaign for better FH services. A patient toolkit was created which helped upskill Ambassadors in understanding the complex decision-making processes within the NHS. 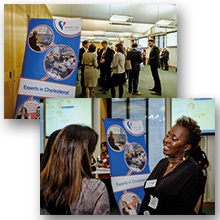 Utilising their patient toolkit and lessons learned during the workshop, Ambassadors attended a parliamentary event to lobby parliamentarians on the need for FH screening. As a result of subsequent political and media pressure, the NSC stated that its decision to reject a screening programme for FH would be revisited and invited HEART UK to submit a new application to the Committee. Hanover Communications and HEART UK delivered phenomenal achievements on a really tight budget. Their objectives were clear, their outcomes were great and they really mobilised key stakeholders working in this area.